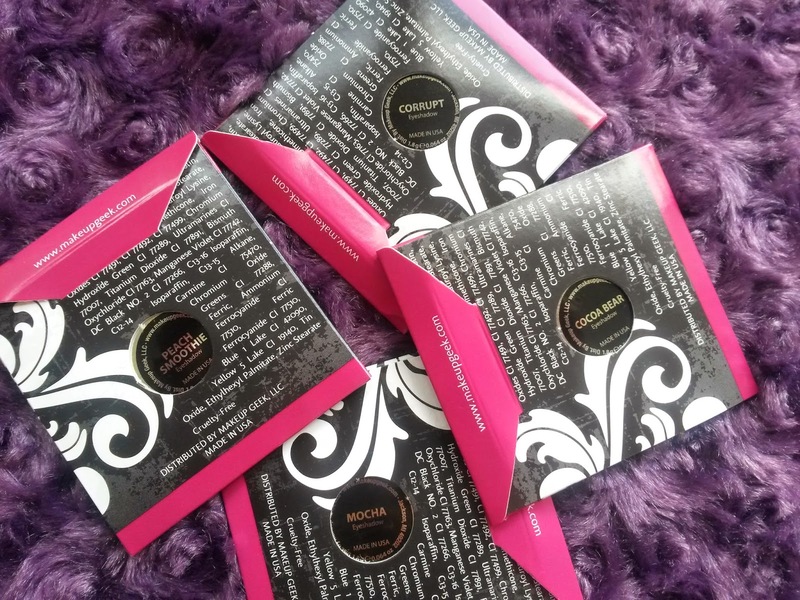 UPDATE 27 FEBRUARY 2015: PLEASE SEE MY NEW POST DETAILING UP TO DATE LISTING OF VEGAN ITEMS AND CONFIRMATION REGARDING THE PIGMENTS. My MUG order finally arrived (ordering makeup from the states is a bit of a pain with customs charges and our postal service basically being slow and sucky) but I am very excited to show you some swatches of what I got. 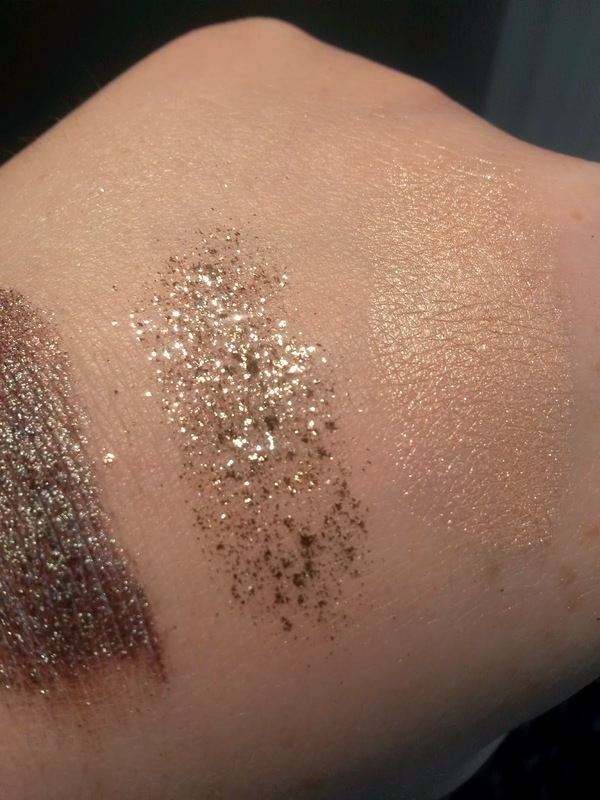 So re the eyeshadows: I found a list after doing a quick google on another blog and I thought I'd double check it as it was a couple of years old. They confirmed there was just one to add to the list that contained carmine. So as of May, this is the list of the eyeshadows that are NOT vegan due to containing carmine. I have emailed them today to check if any of the new shadows launched last month need to go on this list, so if you're interested in those, check back here real soon, as I'll update this post. So let's get on with pics of the stuff that I bought. 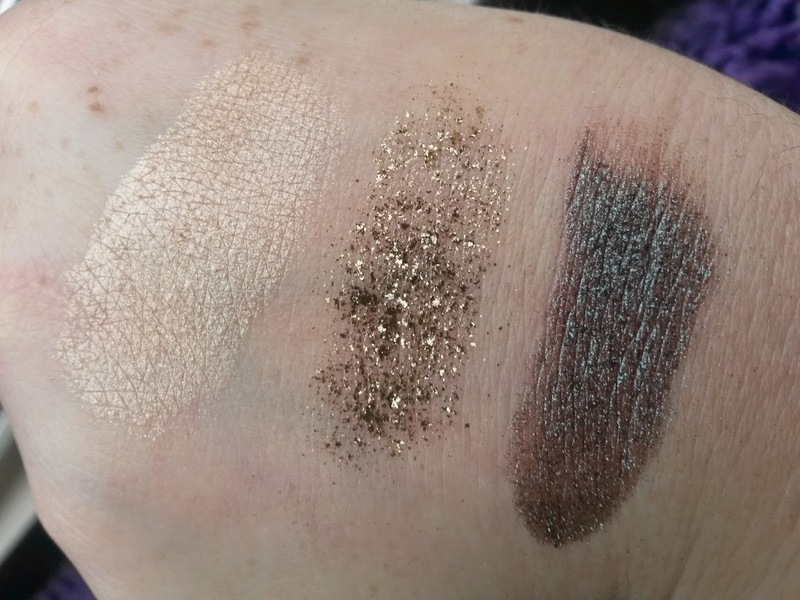 Here's the pigments I got, clockwise from top left: Insomnia, Utopia & Sweet Dreams. 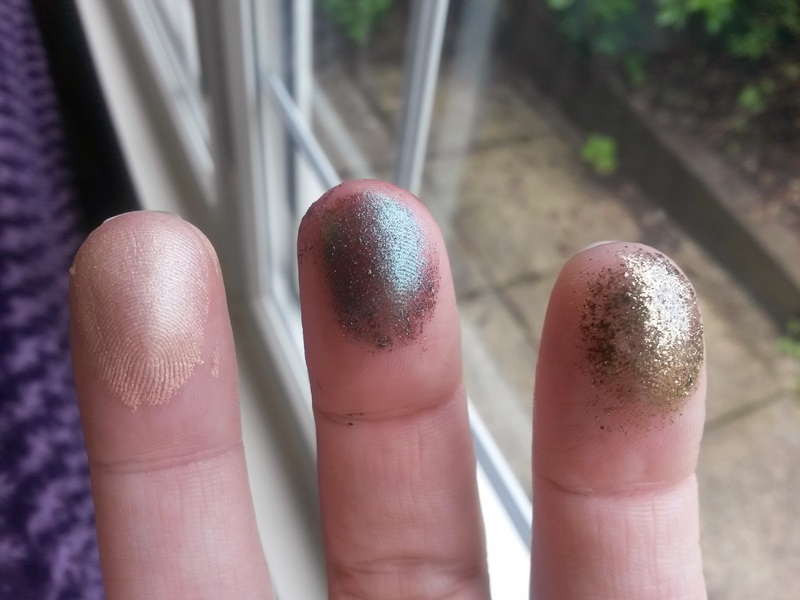 Swatched on fingers, L-R: Sweet Dreams, Insomnia and Utopia. In natural light L-R: Sweet Dreams, Utopia & Insomnia. In artificial light as it shows up the shimmer a bit more. 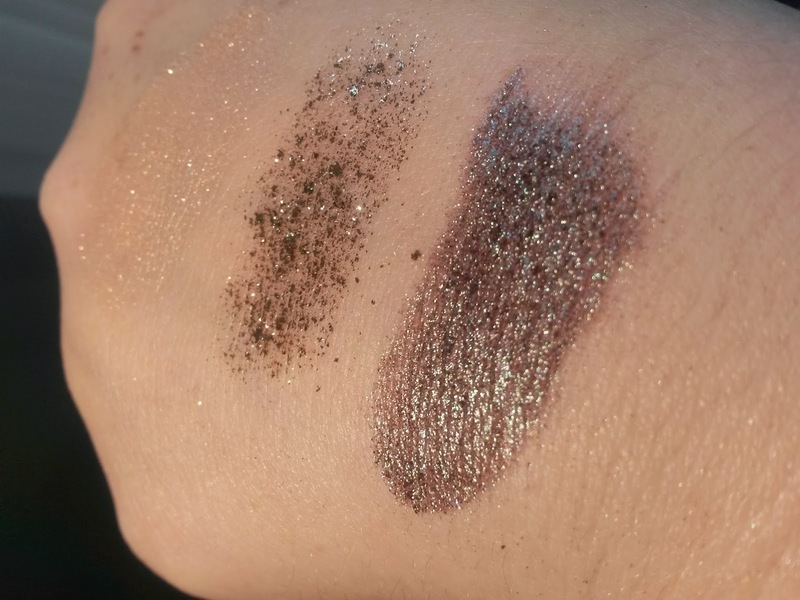 Insomnia (far right) looks black in the jar but swatches as a beautiful browny/blue duochrome. Utopia is quite a chunky gold glitter and it so beautiful. I'm excited to try this out on Saturday night, when I go out dancing! Sweet dreams is a gorgeous peachy gold shimmer. This would be gorgeous all over the lid with a flick of black liner for something super pretty but simple with a bold lip! I haven't swatched them because I didn't buy any exciting colours, I just I bought all rounder colours. By that I mean a couple of blending/transition colours and black. I'm excited for Corrupt because I've heard so many people say it's the blackest, most pigmented black they've ever used. I also got Cocoa Bear, a warm red-toned brown; Peach Smoothie, a peachy blending shade; Mocha, a dark neutral brown. 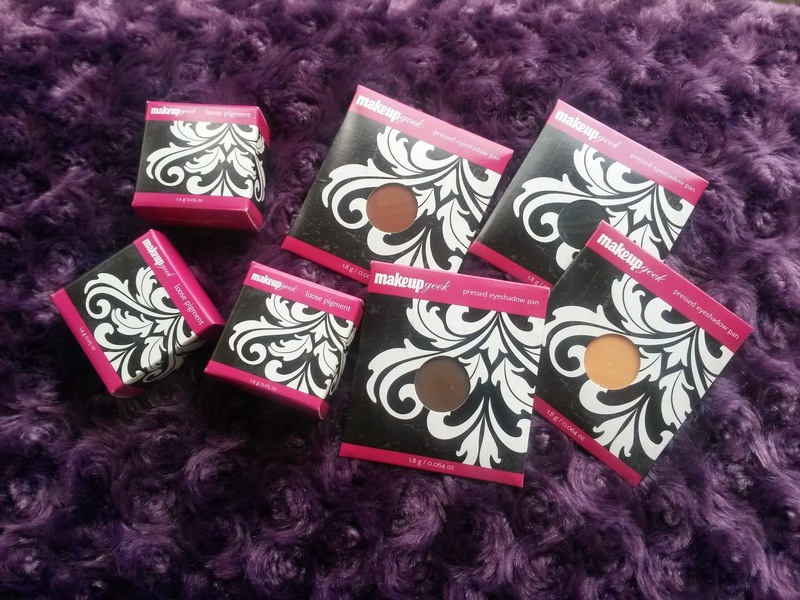 I am fairly certain I'll end up ordering loads more of these shadows as I've liked everything I've ever tried from Makeup Geek. I also got the pans rather than pots because I prefer these and just put into my z-palette. 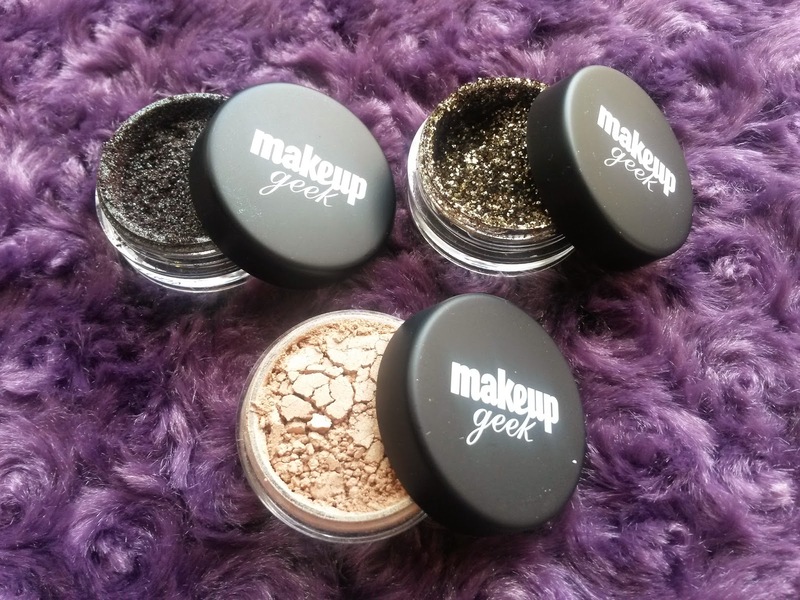 You can buy Makeup Geek from their website. Well it's my birthday today and so I'm gonna try out one or two of these products when I go out later. Look out for pics later in the week!